Syuichi Nakano reports the photographic discovery of a nova in Cassiopeia by Kazuyoshi Kanatsu of Matsue, Shimane, Japan, on December 7.47 UT at photographic magnitude 6.5 on a T-Max 400 exposure with a 55-mm f/2.8 lens. This discovery was confirmed by the discoverer on December 11.42 at photographic magnitude 6.5. Other estimates include: Dec. 5.44 UT, <10.0 (A. Tago, Tsuyama, Okayama, Japan; T-Max); 7.47, 7.5 (Tago); 11.63, 6.5 (S. Otomo, Kiyosato, Yamanishi, Japan, visual); 11.65, 6.4 (K. Tomita, Tokyo, Japan, visual) (IAU Circular 5902). RA. 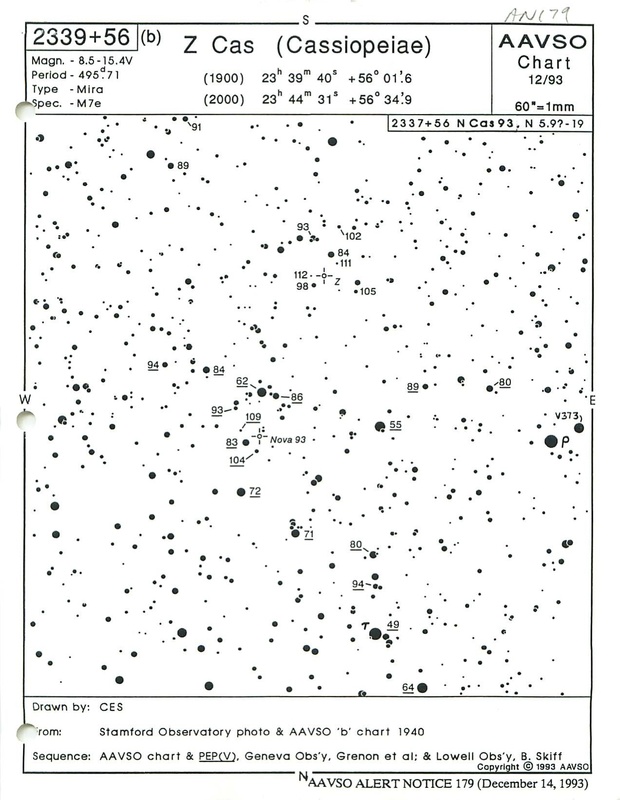 23h 39m 22.36s Dec. +57o 14' 23.7"
B. Skiff, Lowell Observatory, reports that a precursor candidate appears on both the B and R plates of the Palomar Sky Survey at B magnitude 18 and B-R ~ +1.0 (IAU Circular 5904). Peter Collins (Scottsdale, AZ) reports an independent visual discovery of N Cas 93 on Dec 13.29 UT at magnitude 6.0, with a second observation on Dec 13.40 at 6.2. The nova has been around magnitude 6.5, as reported by observers around the world, and shown by the following recent observations: Dec 14. 01 UT, 6.0 (G. Poyner, Birmingham, England); 14.12, 6.3 (R. Stewart, Rochelle Park, NJ); 14.15, 5.9 (C. Scovil, Stamford, CT); 14.18, 6.4 (P. Schmeer, Bischmisheim, Germany); 14.22, 6.1 (W. Dillon, Missouri City, TX). N Cas 93 is close to the Mira variable 2339+56 Z Cas. The accompanying ''b'' chart of Z Cas, prepared by C. Scovil, shows Nova Cas 1993 together with comparison stars with photoelectric (V) magnitudes from Geneva Observatory (M. Grenon et al.) and Lowell Observatory (B. Skiff). Please monitor this bright nova closely and report your observations, indicating the comparison stars used, to AAVSO Headquarters using the charge-free number (800-642-3883). The AAVSO answering machine is on nights and weekends for your convenience. Our congratulations to Kazuyoshi Kanatsu and Peter Collins! The BL Lac type quasar-like object OJ 287 Cnc, which has quasi-periodic brightenings every 11 to 12 years, may be starting be active again, as indicated by the following observations reported by D. York, Abiquiu, NM, and G. Poyner, Birmingham, England: Dec. 9.24 UT, 14.6 visual magnitude (York); 10.25, 15.0 (York); 11.25, 15.0 (York); 14.03, 15.1 (Poyner); 14.26, 15.4 (York). Its last flaring activity was in 1983-84, when OJ 287 Cnc brightened to about magnitude 13.5. There is an international campaign to monitor this object this winter. 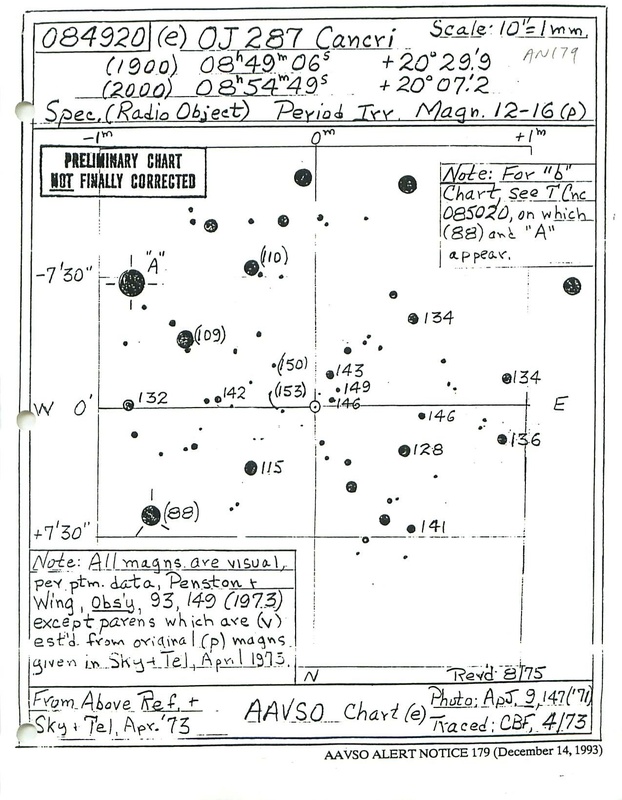 Please observe it closely, using the accompanying "e" scale AAVSO preliminary chart, recording your observations to the minute (four decimal places of the day), and call in your observations to AAVSO Headquarters if you see OJ 287 Cnc brighter than magnitude 15.0. 1. 2138+43 SS Cyg. Astronomers in Europe are interested in observing SS Cyg with the IUE satellite during its next anomalous outburst. Please monitor SS Cyg closely, and inform AAVSO Headquarters when it starts to brighten, and then continue to report your observations of SS Cyg throughout the rise to maximum so we may determine if the outburst is anomalous and inform the interested colleagues. 2. 0749+22 U Gem. Astronomers at the Space Telescope Science Institute and Villanova University are interested in monitoring the next outburst of U Gem with the EUVE satellite, and have asked our assistance. Please monitor U Gem and report your observations to AAVSO Headquarters when you see it brighter than magnitude 13. Please keep us informed of its behavior throughout its outburst. 3. 2318+17 IP Peg. Astronomers in the Canary Islands wish to be alerted to the next outburst of IP Peg. Please monitor this star closely and inform us when it brightens. Please be advised that IP Peg is a cataclysmic variable that has deep eclipses of two magnitudes or more with a period of 3.8 hours and lasting several tens of minutes. Monitoring the eclipses during the outburst is valuable and recommended using the following ephemeris provided by P. Szkody: JD 2445616.4156 + 0.15820616E, and reporting the timing of all positive observations to the minute (four decimal places). 4. 0900-31 T Pyx. Astronomers at the Space Telescope Science Institute have asked our assistance in alerting them immediately when T Pyx has its next outburst. This recurrent nova, which has had outbursts in 1890, 1902, 1930, and 1966, is overdue for an outburst. Observers are cautioned to be certain of their identification of T Pyx. 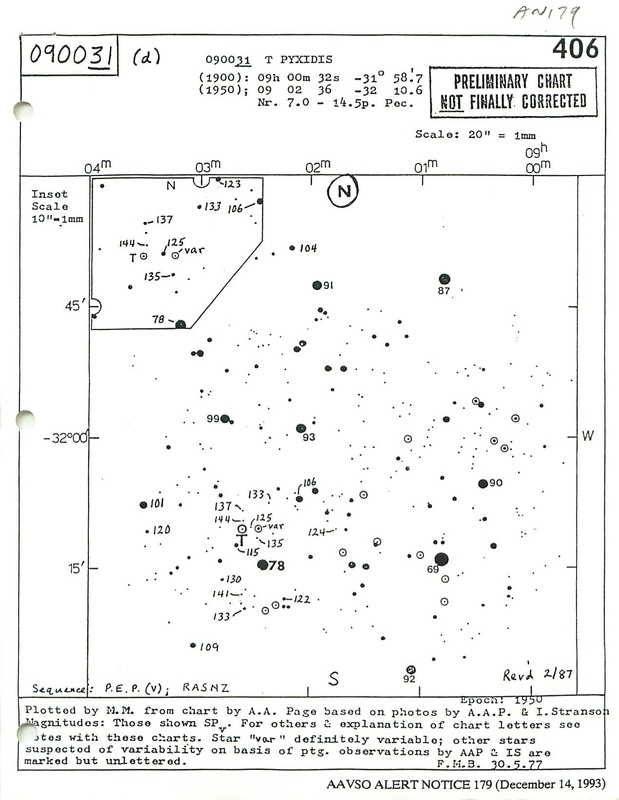 Several times in the we have been alerted to the variability of numerous stars in the field, as indicated on the accompanying chart from the Royal Astronomical Society of New Zealand. 5. 1834-23 V348 Sgr. Observers are reminded to call in your observations to AAVSO Headquarters when V348 Sgr begins to recover from its minimum so that we may inform astronomers at Louisiana State University, who are interested in monitoring it during its rise back to maximum. Most sincere thanks for all your efforts throughout the year to provide data support to so many variable star research programs which use both ground-based telescopes and space satellites. You play a vital part in these projects!